Wow, the weather was fabulous today. Oldham is renowned for being particularly windy and cold but Mr Sunshine really helped us out with probably the best weather we have had so far on an Oldham walk. The decision to move the walk forward so that it didn’t clash with the Manchester 10k, proved to be a good one. The down side to the good weather meant that Dovestone Reservoir was particularly busy and some of us struggled to find a parking space, which delayed the start. But the views are magnificent and really shows how amazing the UK countryside is, when we are given the chance the appreciate it. 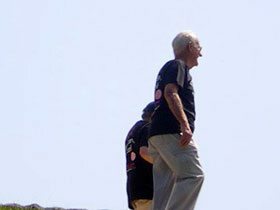 This year’s walk brought some new faces and some longstanding supporters and it really is a fantastic time to catch up with old friends and pass the time with new ones. We walked around the right side of Dovestone Reservoir, up past Yeoman Hey Reservoir before finally reaching Greenfield Reservoir. We then came back down the hill and finished by walking past the other side of Dovestone. In total, we’ve clocked up about 5 miles and it took us about 2 hours. And this may not sound particularly challenging, and really it isn’t. Although, I can’t really think of a better way to spend a Sunday morning than strolling in the fresh air with my nearest and dearest. But what I love the most about the Oldham Walk is that is suits absolutely everybody. All age ranges enjoy it. We don’t walk fast. It is just a lovely gentle stroll in beautiful surroundings. Joshua’s grandparents take part, my 83 year old Uncle enjoys it and the youngsters also love it, with this years youngest age being Erin Costello, aged 8. Then my lovely friend Andrea put on a fabulous free buffet for everyone at her Dad’s pub, The Clarence in Greenfield. It was very welcome sustenance after a sweltering couple of hours and gave us a chance to reflect on the day with each other. Of course, these events for me personally are always tinged with sadness. 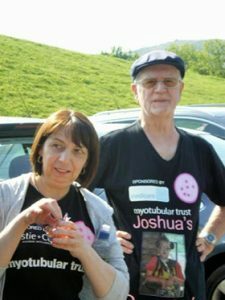 My absolute nearest and dearest are no longer here to enjoy it and my gorgeous son Joshua will never benefit from the cure that will one day occur. Days like today will never be the same for me, but both Joshua and Dave would want me to carry on raising money for a cause that is so close to our hearts. And so I will, and we did. The Oldham walkers almost hit the 50 mark again which is pretty consistent year after year. That just shows that there is such loyalty to the Oldham events and I thank each and every one of you for turning up year after year. I couldn’t do it without you! 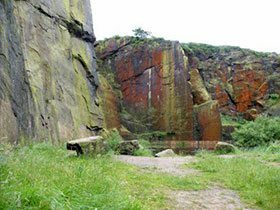 Denham Quarry in Chorley proved to be an amazing location for this year’s abseil. 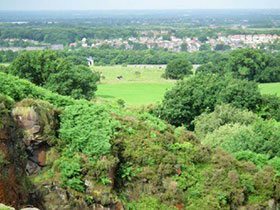 The views are fabulous, especially from the top of the quarry. You can literally see for miles. And the weather was kind, yet again. Phew! Thank you Dave and Joshua. 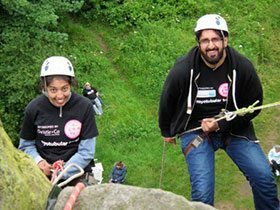 This year’s abseil stood proudly at a dainty 100 foot, so it wasn’t too much of a challenge for us seasoned abseilers. Of course, I am lying completely, because even though many of us have abseiled before, the butterflies still kick in just as you realise that it is your turn to descend. This year, the fantastic Mountain Monkeys (I don’t mind giving them a bit of free advertising – they really were brilliant yet again!) ran two abseil lines at the same time so were speeding down relatively quickly. 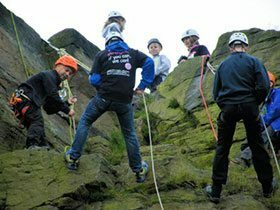 This meant that most people got to abseil 3 or 4 times, which is an amazing experience for everyone, including some forward facing abseils for the extremely brave few. 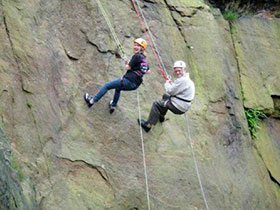 My Dad abseiled once again and the youngsters of the group also enjoyed challenging themselves and quickly got the hang of it after some initial fears. 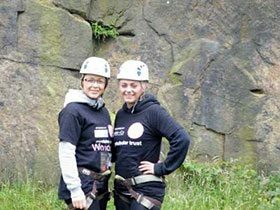 Quite a few of the group were new to fundraising for The Myotubular Trust and hadn’t abseiled before either. 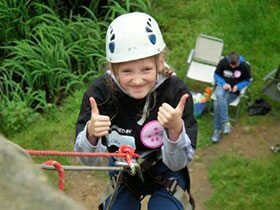 Everyone thoroughly enjoyed the adrenalin rush and seemed to get the bug and vowed to continue fundraising with us, even though Mountain Monkeys are already threatening us with a 200ft drop next year! 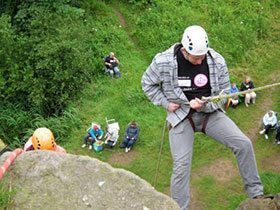 It really is and was a fantastic day out and we all love the extra challenge that the abseil gives us. The only problem is that we have to climb higher and higher. What have we let ourselves in for?? 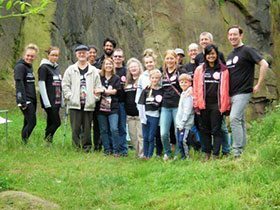 So, it was the Oldham Hope walk on Sunday 10th May. We decided to have a change and we are so glad we did. No more generic cialis lowest price crossing muddy farmer’s fields for us this year. We walked around the gorgeous Dovestone Reservoir in Greenfield. 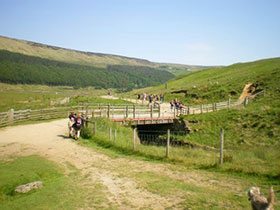 The stunningly beautiful walk took us around Dovestone reservoir, alongside Yeoman Hey Reservoir and up to the top towards Greenfield Reservoir. The views are fantastic and although it looks hilly, the majority of the walk is mostly flat. If you live anywhere near Oldham and have never been – shame on you. 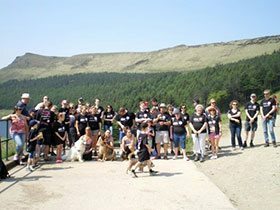 This is Oldham’s 5th year of fundraising and 43 walkers (plus 4 dogs!) joined us to raise money and awareness. The charity t-shirts even prompted two passers-by to donate £7.50 to a cause that they had never even heard of. Of course, this year’s walk was, once again, tinged with sadness. 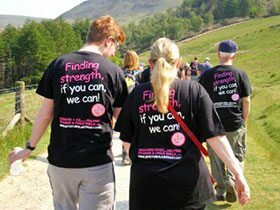 Organising and walking without Dave was certainly a difficult experience, but, he and Joshua will have been there in spirit. And they probably had a hand in making sure Brenda kept on her feet this time (she knows what I mean!). Despite the sadness, we managed to have some fun along the way and managed to catch up with people that we don’t see so very often, talking and remembering Joshua and Dave. When you are planning to abseil down a 128 foot tower, it really would help if the weather was nice. But no. This year it was windy, cloudy, windy, cold and did I mention how windy it was? When we arrived at the car park (which is at the bottom of a very big hill), we couldn’t actually see the tower, it was that misty and cloudy. We were all hoping it had been stolen, but we weren’t that lucky. Before we could even plan the descent from the top of the tower, we had to climb upwards for about 20 minutes. As we approached the tower, the mist cleared and the tower got bigger and bigger and bigger. When we were finally stood beneath it, your neck starts to hurt and the butterflies kick in. Mountain Monkeys had decided not to wait for me to arrive (yes me, the event organiser!!!) and already had a willing volunteer (I didn’t make them did I!!!!!) abseiling down. I hadn’t set up my cameras and video so I had to leg it up 148 steps to stop anyone else going down. Poor Ian had to do it twice so that I could catch him on camera! The wind at the top of the tower was horrendous. It feel like we are at the top of Blackpool Tower and so cold, our hands went numb very quickly. Joshua’s grandparent’s barely got to see any action as they were forced to shelter within the tower itself. But did we let any of that stop us? Oh no. With legs shaking, butterflies flying and eyes pretty much shut, one by one we climbed on top of the tower and positioned ourselves at the side of Jason, our good looking, helpful and encouraging instructor. Those of us with short legs pretty much did the splits when we had to step down to the ledge before we could set off. It certainly wasn’t glamorous. Once on the ledge, we no longer had to look down and could just face forward and start the descent. It really didn’t help when someone shouted “you are about a fifth of the way down”. A fifth! I thought I had been travelling for ages. To be honest, once you set off, it doesn’t really matter how high up you are. The worst bit is going over, leaning back and trusting the equipment. Jason reassured us that absolutely nothing could go wrong and he was right. Although, Diane discovered she had Tourettes, Liz followed Diane and thought she was going to die, Julie said she hated every minute and my 75 year old Dad showed everybody up by just flying down. The girls at work have fallen out with me and are trying to persuade me that they will get loads of people to sponsor them having coffee and cake next year! Having said all that, we all loved it and if it wasn’t for the weather, we might have been able to do it again. We are now back on terra firma and trying to decide how we can top that. Higher again or something completely different? Oh I’m getting nervous just thinking about it. Time for a brew while I deliberate how to get the girls talking to me again! Next2016 – The Myotubular Trust 10 year celebration.